Although the topic of Android apps being able to run on the Blackberry PlayBook (or QNX in general) isn't exactly new news, Bloomberg today posted some new details about what they have been hearing about the happenings at Research In Motion. According to the article, Research In Motion has allegedly changed their minds about using the Dalvik Virtual Machine on the Blackberry PlayBook based on the patent disputes happening between Oracle Corp. and Google. 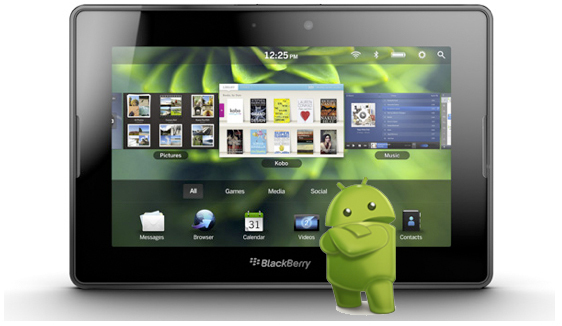 Instead, they are opting to take another path that will allow Android applications to run on the PlayBook. No mention of what other method they will be using at this time but a lot of companies have been creating virtualization platforms as of late, the latest being Myriad which has recently announced their Myriad Alien Dalvik. The Myriad Alien Dalvik allows Android apps to run seamlessly on other platforms and will be demoed at Mobile World Congress later this month using Nokia's MeeGo platform. That's not to say Myriad Alien Dalvik will be used but nothing is stopping Research In Motion from reaching out to any other virtualization partners to help out.